Once the hair growth cycle starts, it should keep going and never stop. And, for certain types of hair in certain regions of the body, that’s exactly what happens. Pubic hair and body hair for example, will continuously keep on growing throughout life. But, for those who are losing their scalp hair, it can very seem much more like a hair loss cycle! So, to help form a clear distinction between hair loss that’s normal and hair loss that’s not, this article fully explains the natural hair growth cycle and reveals quite a few surprising things about how your hair grows. Anagen, Catagen, Telogen… and Exogen? The simple answer to the question "How does hair grow?" 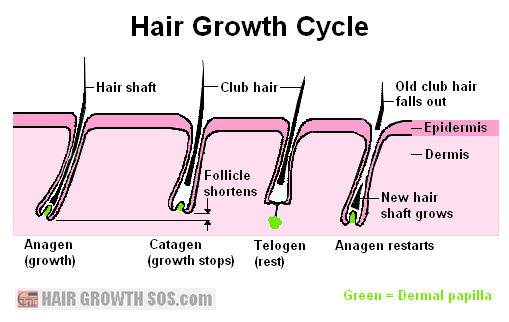 is that there are three phases of a hair growth cycle: anagen (growth), catagen (growth stops) and telogen (rest). Four if you include exogen (shedding). * However, there's quite a bit more to each stage of this cycle, as you'll see below. * Note: Not all websites seem to recognize, or even mention, exogen as an actual phase of the hair growth cycle that's distinct from any other. But, exogen is considered by some to take place after telogen, whereby the old hair shaft gets dislodged from the follicle and finally falls out. Anagen is the hair growing phase. It usually lasts 3 to 5 years, but this can vary (as explained further down the page: Five Factors Affecting the Hair Growth Cycle). In the diagram below, you can see that stem cells from the bulge area migrate down and along the outer root sheath towards the dermal papilla (as indicated by the blue arrow). And this migration could possibly involve sebum flowing down from the sebaceous gland: notice from the diagram that the sebaceous gland conveniently sits immediately above the bulge – something which clearly suggests that sebum might provide a transport mechanism for the stem cells. These stem cells then form the lateral disc. And when the rest of the hair breaks down (during the catagen phase) they turn into hair germ cells (i.e., cells which can go on to produce a new follicle in the next hair growth cycle). Anagen lasts much longer than catagen or telogen. So, not surprisingly, most of your hair will be in the growing anagen phase at any one time (about 90%). During catagen, the hair follicle breaks down – active hair growth stops and certain cells in the follicle die, causing it to shorten. But, as it does so, part of the outer root sheath stays attached to the dermal papilla ready for the next hair growth cycle to begin. 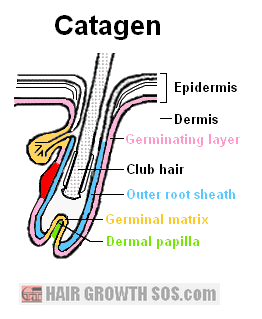 In the catagen diagram below, you can see that the hair shaft detaches from the germinal matrix. But, some hair cells left inside the germinal matrix attach to the end of the hair shaft as a small lump of keratin. The hair shaft is then called a club hair. Catagen lasts just 2 or 3 weeks. And only about 1% of your scalp hair follicles will be in catagen at any one time. Telogen is a period of rest for the hair follicle. During this time, the follicle stays shortened, and the outer root sheath stays attached to the dermal papilla (see diagram below). Then, when telogen ends, hair germ cells start growing a new hair follicle from the dermal papilla and the next hair growth cycle starts again. Telogen lasts 3 to 4 months. About 10% of your hair follicles are in telogen at any one time. 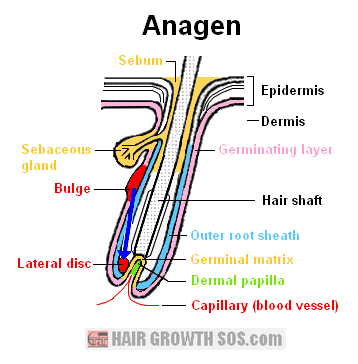 The hair growth cycle diagram below brings together all three phases (anagen, catagen and telogen). Some people seem able to grow their scalp hair much longer than anyone else. And this, of course, is mostly down to genetics. But, it’s not "hair length" that’s the genetic characteristic - it's actually the genes responsible for the duration of anagen that dictate how long your hair will grow. Obviously then, the length of anagen for scalp hair can vary quite a lot from person to person – it could last as long as seven years or as short as one year. So, if want to know just how long your scalp hair can grow, simply avoid scissors for the next seven years! The type of hair you have (vellus, terminal or pubic), and the role it plays, varies from place to place around your body. And with this variation comes differences in the duration of anagen and the speed at which it grows your hair. So, for example, anagen grows your scalp hair faster, and lasts much longer, than it does for hair anywhere else on your body. And this, of course, is why your scalp hair grows long, whilst your body hair and eyebrows stay short (thankfully). Scalp hair can often grow faster in summer than it does in winter. That’s because anagen tends to speed up during the summer months. But, this speeding up of anagen also means that more hair will enter catagen and telogen faster than it does in the winter months. And the consequence of all this? An increase in hair loss! The next page explains more about this seasonal variation in the rate of hair loss. Different types of hair loss affect the hair cycle in different ways. For example, telogen effluvium will cause more hair than normal to fall out and enter the telogen phase. And androgenetic alopecia (male pattern baldness) causes hair follicles to miniaturize and produce weaker, thinner hair during anagen. Certain drugs can also affect the hair growth cycle. For example, finasteride (which is used to treat androgenetic alopecia in men) can extend anagen and so, allow more hair to grow. It very much seems to me that one of the key players in the whole process of hair growth is the germinating layer of the epidermis. That's because it appears to be involved in several, very important steps, as you can see from the points below (taken from this page and the previous page). 1. Hair growth all starts from the germinating layer, which grows down from the epidermis and into the dermis of the skin. 2. This growth then develops into the outer root sheath (which forms the inner wall of the follicle). 3. The outer root sheath then forms both the germinal matrix (which goes on to grow the actual hair shaft) and the bulge (which provides stem cells that migrate down to form the lateral disc and so provide germ cells ready for the next hair growth cycle). 4. 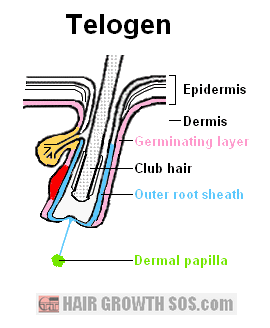 Even during telogen, the dormant phase, the outer root sheath stays attached to the papilla cells that remain (i.e., in preparation for the next hair cycle). As you can see, hair follicle growth and hair shaft growth mostly seem to be driven by cells originating from the germinating layer of the epidermis rather than cells from the dermis. Look after your skin if you want to look after your hair! The hair growth cycle is a repeating process that should, in theory, continue throughout life. But, of course, for most men (and many women), that's not the case. Instead, they suffer hair loss (androgenetic alopecia). A process that, once started, tends to relentlessly keep on getting worse and worse until, ultimately, there might not be very much hair left. It doesn’t take long for someone to realize that they’re losing more hair than they should. And, in time, many other people start noticing it too. But how do you know if the amount of hair you’re losing is normal? The answer is revealed on page 3. This is page 2 of 3. Read final page? How much hair loss is normal? Read previous page? Hair structure, hair growth and hair loss. Comments and questions about the page you just read are welcome. Just post in the box below. Please also observe the Commenting Rules (opens in a new window). "I am extremely happy to say that my hair has actually started to thicken up at the back of my head. Amazing! All the supplements I have taken over the years have never given me results such as this."